Today I'm switching gears and heading back into the annual catalogue. Do you ever get so excited about the new mini catalogues, and all the wonderful new product, that you kind of forget about the annual catalogue? As a demonstrator, I do this all the time, totally forgetting about all the other wonderful stamp sets I have. My card today features the Photopolymer stamp sets: Bravo (Greetings) and Perpetual Birthday Calendar (Stars). Don't let the word: calendar throw you off. This set is great for adding extra little details to a design. My colour combo is Rose Red, Melon Mambo, Pink Pirouette, Basic Black and Whisper White. 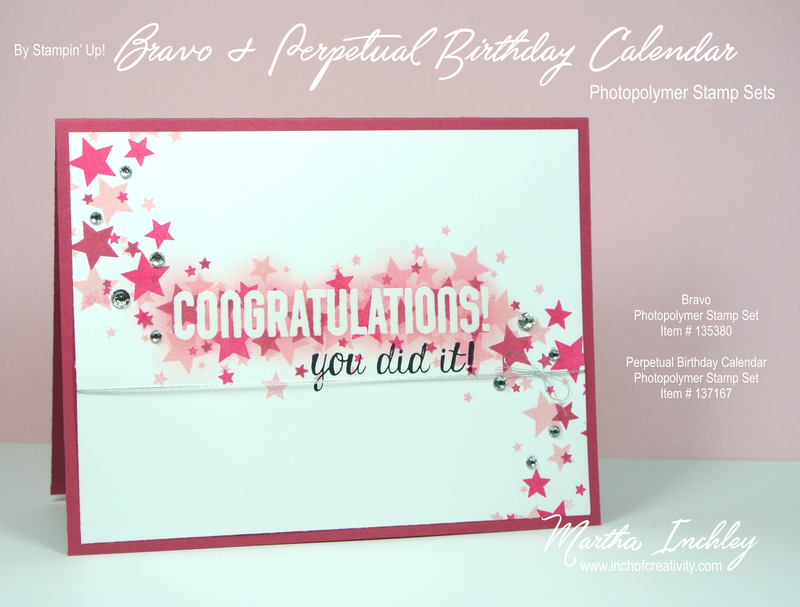 To start, I stamped the greeting: Congratulations, with VersaMark and embossed it with clear embossing powder. Then I stamped the stars in the 3 different ink colours, making sure to stamp over the greeting a much as I could. Once I was finish stamping, I used a sponge dauber to clean the ink off my greeting and to spread it around. At this point, my greeting still didn't stand out as much as wanted it to, so I used my sponge dauber and swirled Pink Pirouette over top of it. Once I was happy with it, I wiped off any ink left with a kleenex. If you find that your embossing lost it's shine, just run the heat tool over if for a few seconds and it should shine back up. 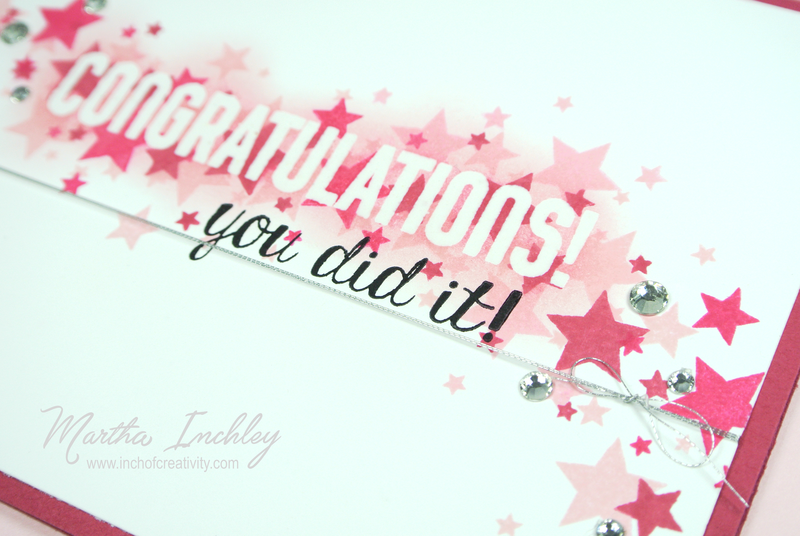 To finish my card, I stamped "you did it!" in basic black, added some Rhinestones and tied Silver Metallic Thread around it.